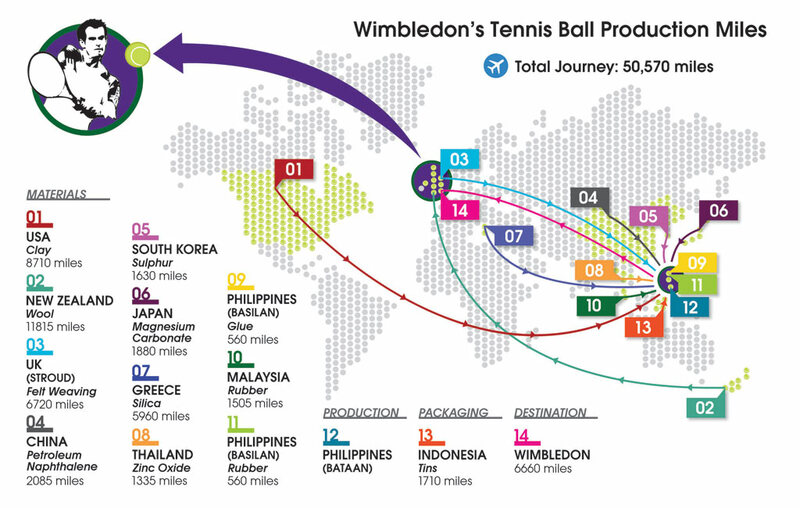 Research done by Mark Johnson, an operations management expert at Warwick Business School, has found that the components that make up a Slazenger champion grade tennis ball for use at Wimbledon travel over 50,000 miles and across four continents during the ball’s production. Much of it by air. The balls are produced in the Philippines. Wool travels by air from New Zealand to Stroud (UK) to make the felt; that is then shipped by air to the Philippines; clay is shipped from South Carolina in the USA, silica from Greece, magnesium carbonate from Japan, zinc oxide from Thailand, sulphur from South Korea and rubber from Malaysia to Bataan (Philippines) where the rubber is vulcanized. Slazenger shut down its factory in Barnsley in the early 2000s and moved the equipment to Bataan in the Philippines. They still get the felt from Stroud, as it requires a bit more technical expertise but that adds a lot of air miles. Dr Johnson said: “It is one of the longest journeys I have seen for a product.” Presumably because air transport is cheap. 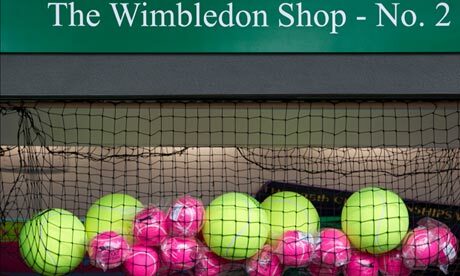 For over a century, the Slazenger tennis balls used at Wimbledon made the short journey from the company’s Barnsley factory to centre court. Today, a new analysis has revealed, the official balls travel over 50,000 miles around the world before finally arriving from the Philippines factory in which they are now made. 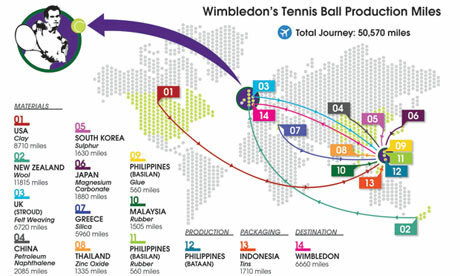 Johnson’s research shows materials for the Slazenger balls fly between 11 countries and across four continents before being manufactured in Bataan in the Philippines and then travelling the final 6,660 miles to SW19. He found that the complex supply chain sees clay shipped from South Carolina in the US, silica from Greece, magnesium carbonate from Japan, zinc oxide from Thailand, sulphur from South Korea and rubber from Malaysia to Bataan. Wool is then shipped from New Zealand to Stroud in Gloucestershire, where it is weaved into felt and then flown back to Bataan. Meanwhile, Johnson found, petroleum naphthalene from Zibo in China and glue from Basilan in the Philippines are brought to Bataan where Slazenger, which was bought by Sports Direct in 2004, manufacture the ball. Finally tins are shipped in from Indonesia and once the balls have been packaged they are sent to Wimbledon. The Barnsley factory closed in the early 2000s. “The tennis ball provides Slazenger with the perfect synchronisation of materials produced at a very low cost near to the manufacturing labour in the Philippines, which is also at very low cost,” said Johnson. The problem here is a simple one. Monetary cost has been minimised but, with such a vast footprint, it seems very unlikely that the environmental cost has been even closed to minimised. It is a striking example of how failing to ensure that manufacturers pay the true cost of their environmental impact can lead to extraordinary supply chains in a globalised world. Posted: Wednesday, June 26th, 2013. Filed in General News, Recent News.